I propose the term ‘exploratory diagrams’ to describe an approach to diagramming which goes beyond familiar statistical and explanatory diagrams so as to focus instead on how the phenomenal act of constructing a diagram is productive of knowledge rather than being merely a representation of already existing knowledge or ‘information’. Diagramming in this sense has particular relevance for configuring social forces and relations of a more complex, abstract and non-evident nature, and for envisioning new models of being beyond current conceptual and ideological frames. It can also constitute methods of close textual reading and critical reflection relevant to art education. I will discuss these ideas in relation to my own diagrammatic works and methods such as Metallurgy of the Subject, Diagramming Politics, Social Body Mind Mapping, Plato’s Caves and Illustrating Capital. The topic of diagramming is introduced as a synthetic approach to the study of neoliberal pressure on the creative and arts sector, with a particular focus on contemporary art institutions (museums, biennials, summits, etc.). Rather than framing diagramming as a simple medium of expression, I will introduce diagramming as a critical methodology to investigate the gap between cultural analysis, critical theory and institutional critique. As a handwriting practice synchronized with the language of thought, it also operates as a critical (post-internet) response to the visualization of information through (reductive) forms grounded mainly on interferential statistics (based on dubiously gathered information). 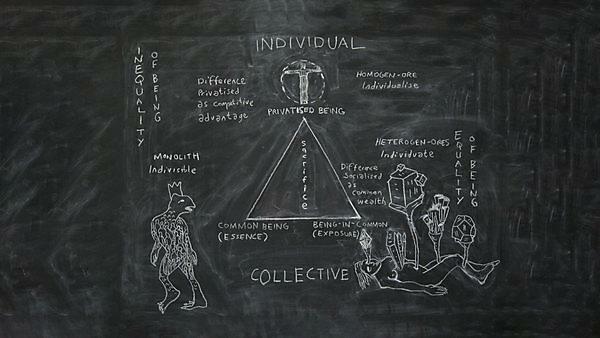 In addition, when used in to carry out an analysis of representational data (graphs, facts, network analysis maps) and various other representations of the art world system, diagramming can also clarify our understanding of existing models (and of power structures) to stimulate the modification of our predetermined conceptions, opinions and assumptions. Mara Ambrožič is a cultural critic, research curator, and expert on international cooperation strategies. Currently she holds a PhD fully funded research position within the Exhibition Research Lab at the Liverpool John Moores University (2016-2019). Previously, she has lectured at IUAV University of Venice (2007-2012, 2017) and was a visiting lecturer at University Sciences-Po in Paris (2012). Between 2013 and 2014 she served as research curator for several projects, including the reconstruction of Marcel Broodthaers’ Section des Figures (Monnaie de Paris, 2015). Recently, she was Director of NSK State Pavilion presented during the Venice Biennale (2015-2017). She co-edited several books such as Art as a Thinking Process: Visual Forms of Knowledge Production (Sternberg Press, Berlin, 2012). Founder of Libraries of the Future in Paris, she is also member of Raw Material Company of Dakar, and associate editor of Archive Books, Berlin. Dean Kenning’s artworks range from kinetic sculptures to videos and diagrams, often employing DIY, allegorical and autodidactic methods and modes of representation to engender visceral, uncanny and humorous encounters and to explore political and philosophical material. He has had solo exhibitions at Beaconsfield, Piper Keys and Five Years and he has exhibited in many group shows including at the ICA, Greene Naftali and BAK. He is a member of the Capital Drawing Group and the Social Morphologies Research Unit. He has published articles in journals such as Third Text, Art Monthly and Mute, including on the politics of art and art education. He is a Researcher at Kingston School of Art and also teaches Fine Art at Central St Martins.